Some phrases stick in your head for a long time. A rather colourful Product Development lecturer once commented that ‘accountants are the condom on the (man parts) of progress’. I have censored his statement here for obvious reasons but the intent of his remark is clear. Looking at creativity by what your budget allows you to achieve limits your fullest potential. So why do budgets – the B-word – have such a bad name? After all, managing budgets is a great skill to have. We are encouraged to be wise and mindful of our resources. In creative terms, working with a budget as you develop your ideas or ambition is like buying a dress and then dieting to fit into it. Of course you should be aware of your current financial means. However, they should not dictate how ambitious you can be. What could you do if money wasn’t a concern? Are you able to fund it with your existing budget? How else could you get it done? Budgets are a tool rather than a permission to make something amazing happen. The discipline and strategy of budget management are good for things you want to control. However, chances are you do not want to limit your best possible ideas before you have had them because you don’t think you can afford it. 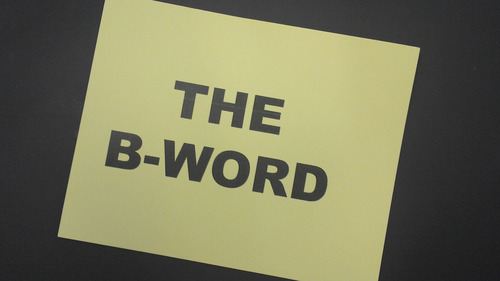 To get the best out of your creative process, teams or efforts, forget the B-Word. At least until you have a good enough idea. Then use your best budgeting skills to make it happen.